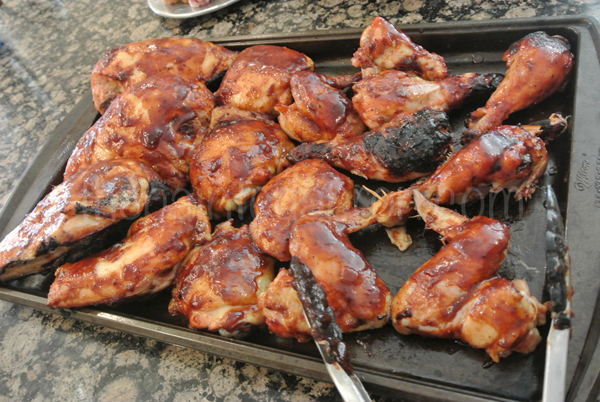 Barbeque chicken is really not a recipe, it’s more of a technique perhaps using a favorite sauce, anybody and everybody barbeques chicken. Recently HHjr cooked some chicken for us. 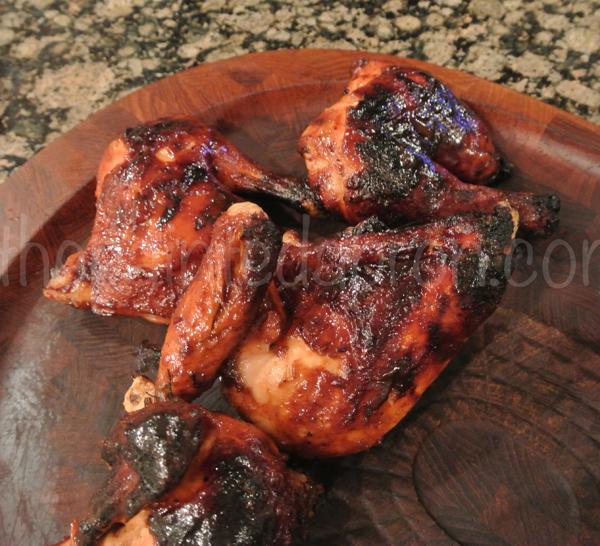 Some barbequed chicken. Now I like barbequed chicken fine, but to tell you the truth, I’m not a big barbeque fan, just every now and then…..SSSSHHHHHHH!!! You can’t say that out loud in the South! It’s a SIN! So this is our little secret…. and an overnight stay in the refrigerator! 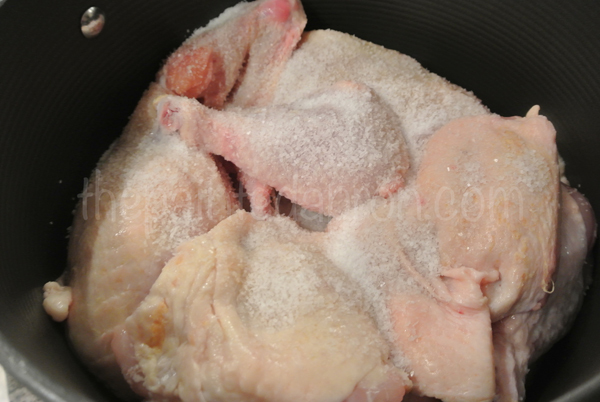 Have you ever brined your poultry? Brining is a method used to tenderize poultry and is commonly used for turkeys. A brine is typically a salt water bath with spices. We have tried it with a turkey before and couldn’t really tell any difference. I’m not sure what possessed HHjr to brine his chicken but let me tell you, it was the most moist flavorful tender chicken I have ever had. 1 fresh whole chicken, ask the butcher to cut it up for you. This insures a fresher chicken. The potatoes we made are just the regular old smashed potatoes that have been so popular on Pinterest, but we kicked them up a little by using Rosemary Salt, Lemon flavored Olive oil and Parmesan Cheese. Anyway you do these, they are delicious. You can prep them ahead of time and then bake right before you want to eat. These are so easy to make and always a hit! 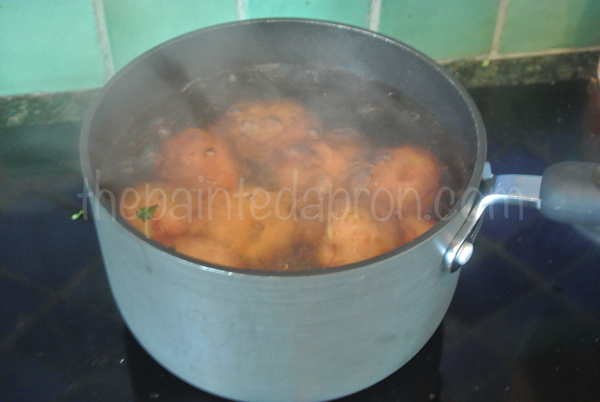 Just boil the potatoes for about 20 minutes until they are soft enough to smash down into a “flatish” mound. Place them on a foil lined baking sheet that has been sprayed so they won’t stick. Smash them with a potato masher or a big spoon, anything will work. I like to use the smallest red potatoes I can find, but you can use big ones. Just cut them in half after boiling and then flatten them out. That’s it! This particular batch had several bigger ones that weren’t quite done enough so I had to help them along with a few slashes. 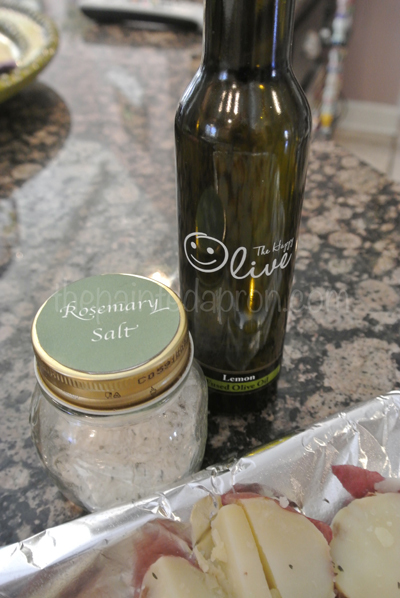 Season liberally with Rosemary Salt, salt or seasoning of your choice. Drizzle with Olive oil. I used lemon Olive oil, but use any flavor you like. A little Truffle oil would be good too. 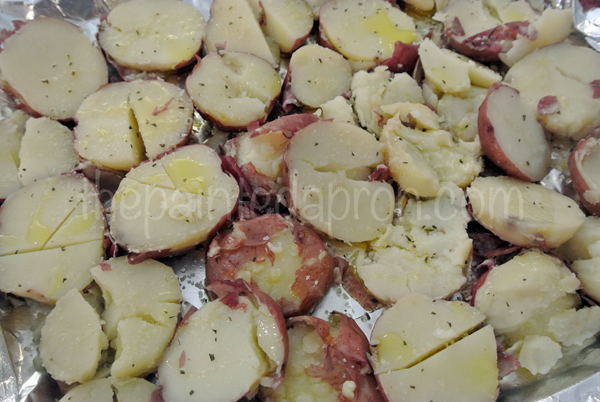 Bake them at 400 until they are brown and crispy, 45-60 minutes, depending on the size of your potatoes. 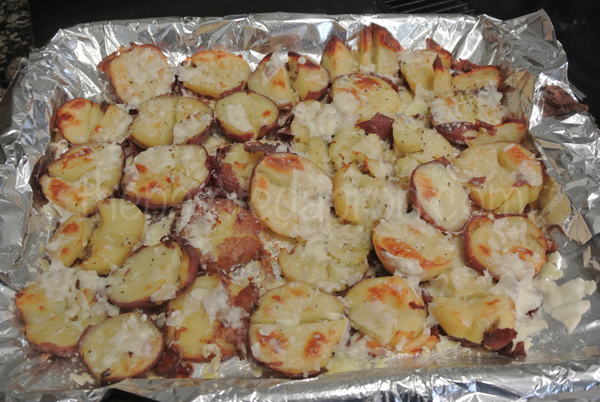 Top with Parmesan and return to oven for 3-4 minutes to melt cheese. Plan on 2-3 potatoes per person. I hope you enjoy this little taste of summer days ahead, even if you can’t cook it now you can dream about it! Thanks Maureen! Happy VDay to you to! This is making me hungry! I am a big fan of chicken, regardless of how it is cooked! Thanks for sharing such great recipes with us! I won’t tell anybody if you don’t tell anybody that I, a native Kansas Citian living just a few miles from the famed 18th & Vine made famous in the “Goin’ to Kansas City” song, don’t care in the least for jazz!!! I could eat bbq chicken day in and day out, though! Brining the chicken…I think this is something I must try! I’m for a more tender, juicy piece of chicken whenever, wherever and however I can get it! I used to think that KC Masterpiece sauce was made here in KC, but it’s not. I still like it. The potatoes sound good, too. Simple. Love that! I’m going to pin the chicken!!! KC is not made in KC? What??? Isn’t that false advertising or whatever? I am totally disillusioned! But I will still buy it, it is well priced and delicious every time!